Cuba´s Tourism Ministry reported the arrival of 2 million international vacationers on June 13, a figure reached 27 days before it was reported last year thus confirming the good position of the Cuban destination in the world tourism scenario. The particular Cuban tourist offer, the rich cultural attractions, the warmth of the people and the safety of the country are some of the major reasons for international tourists to pick the island as their holiday destination. 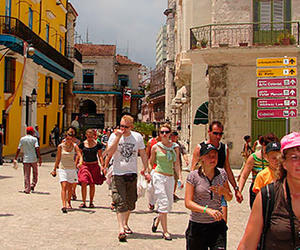 Major sources of visitors to Cuba are Canada, Germany, the U.K., the U.S. France, Italy, Spain, Mexico and Argentina. Cuba has seen an increasing number of US visitors who come here under licenses issued by Washington, since those nationals are still banned from coming on tourist visas, due to the over-50-year US blockade of the island. The Cuban tourist sector continues to keep high quality service, as it diversifies its offer and opens new hotels in important territories like Havana, Varadero, Santa Maria Key, Jardines del Rey keys and eastern Holguin province.